Last week I gave you the instructions for a masala paste that my dad's family use for cooking fish. I don't eat much fish and so I have found other ways to utilise this mouth-watering concoction. 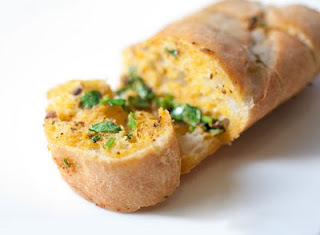 This week I am going to give you the instructions for masala garlic bread. Essentially it is like garlic bread but with an Indian twist. Using a sharp knife, make diagonal incisions about 3cm apart, as if you were slicing the loaf but without cutting right through. In a bowl mix the butter, masala paste and coriander together and spread into the incisions in the bread. Wrap the bread in foil and place in the oven for 10 minutes. Now open the foil and cook for a further 5 mins to give a crusty finish.